Since Lightroom version 3, Adobe has been providing a Lens Corrections sub-module within the Develop Module to correct various optical issues commonly seen on all lenses. It is a very powerful and complex tool that can be applied to one or many photographs with a couple of quick steps, potentially saving many hours of post-processing time. In this article, I will explain what the Lens Corrections sub-module is, how it works and how you can effectively use it to correct optical issues in your photographs. I will also show you a method of adding a lens profile manually, if you have unsupported lenses in your arsenal. 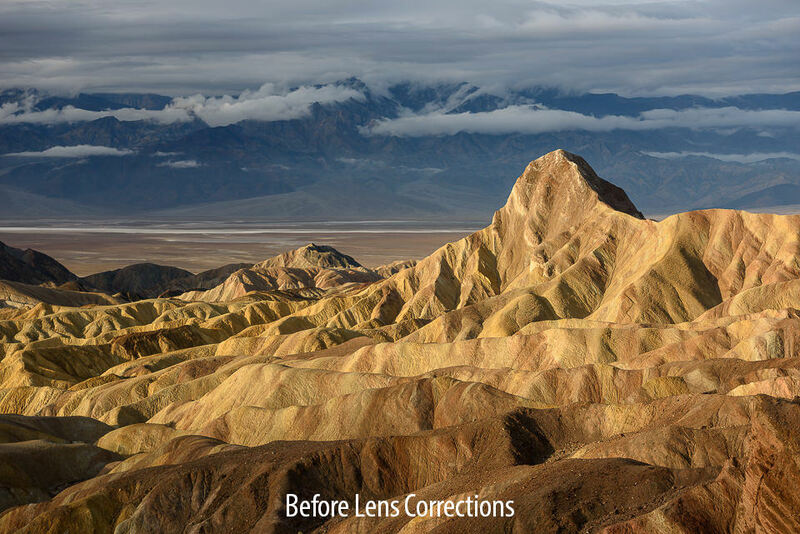 1) What is “Lens Corrections” in Lightroom? Lens Corrections is a tool within Lightroom’s Develop Module (hence I often refer to it as a “sub-module”) that allows fixing such lens problems as distortion, chromatic aberration, vignetting and perspective correction “non-destructively”, without leaving Lightroom. The beauty of the Lens Corrections feature in Lightroom, is that just like any other setting, lens corrections can be copied from one image to another, applied to hundreds of images at once, or can be set up as an import template, automatically applying corrections to images during the image import process. Keep in mind that lens correction is not a simple fix that applies to any lens – corrections are lens-specific. Since each lens model is designed with a unique optical formula, lens corrections must also be uniquely customized for each model. For example, one could not take a lens correction from the Nikon 35mm f/1.4G and apply it to the Sigma 35mm f/1.4G just because they share the same focal length and maximum aperture. Adobe staff spends time working with a number of different lenses and they continuously add support to new and existing lenses when new versions of Lightroom are released. Move the slider to the left and the right sides to reveal how the image looked before and after Lens Corrections were applied to the image. As you can see from the above example, this feature can drastically alter the look of your photos and make them instantly look better. For the above case, I enabled correction that fixes distortion and vignetting, then enabled the removal of chromatic aberration and also made Lightroom apply Full level, horizontal and vertical perspective corrections. As a result, Lightroom not only fixed visible distortion and other problems, but it also aligned the lines in the image (perspective correction became available in Lightroom 5). The same field can be located under the “Profile” tab. If you have an older version of Lightroom and you don’t see a “Basic” tab, you will have to enable it from the “Profile” tab. 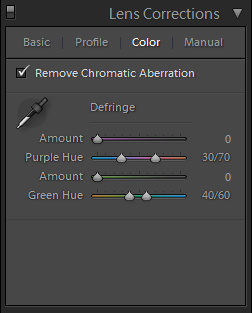 In order to remove chromatic aberrations, you also have to check “Remove Chromatic Aberration”, which is also available under the “Color” tab. 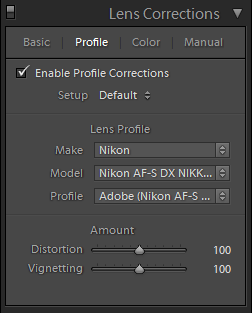 The “Enable Profile Corrections” check mark serves exactly the same purpose as the one under the “Basic” tab – it enables automatic corrections based on the type of lens used. 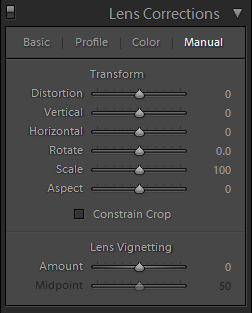 If a lens is supported by Lightroom, as soon as you put a check mark in this field, the three drop downs under “Lens Profile” will be automatically populated. If a lens is unsupported, the drop downs will say “None”. From there, you can manually pick a lens Make, Model and Profile, but I would not recommend to do that, since you do not want to apply a lens profile from one lens to another. As I have already pointed out above, lens profiles are lens model specific. If automatic corrections are not good enough, you have two additional sliders for tweaking distortion and vignetting. If the effect of correction is too strong or too weak, you can tweak it from there. As for the “Setup” drop down, I always leave it on “Default”. If you move the distortion and vignetting sliders, it will automatically change to “Custom”, which indicates that the default values have been changed. The “Auto” setting never worked for me, but I would stay away from it, since you probably do not want Lightroom to guess anything for you. Alternatively, you can click the color picker to the left of “Defringe” and click the color that you want to neutralize. I love this feature (it was introduced in Lightroom 4.1), because it allows you to reduce not just lateral chromatic aberrations, but also nasty cases of longitudinal chromatic aberrations, better known as “bokeh fringing”. Personally, I rarely ever bother with this tab. In some rare cases when working on an unsupported lens, I might wander off to this tab and play with the distortion and vignetting amount sliders, but that’s about it. 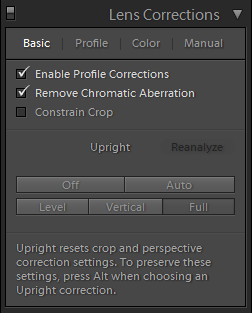 As shown in the screenshot, uncheck everything but “Lens Corrections” and “Process Version”, then click “Copy” to copy the settings into the Lightroom buffer. Then select other images that you want to apply the same settings to as a group, then right click on one of the images in the group and go to “Develop Settings” -> “Paste Settings”. Once you do that, all of the modified settings will apply to the rest of the images that you selected. Correcting chromatic aberration and vignetting issues in your images by manually adjusting the sliders in Lightroom works fine for most cases, because you can easily see CA and vignetting in images. Distortion, however, is not as easy to fix, because an image would have to contain straight lines from corner to corner in order for you to correctly fix them. If you shoot with fisheye or ultra-wide angle lenses that suffer from severe distortion, you might be able to visually fix most images, but the results might not be consistent from image to image. If you want to have consistent results, the best thing to do is to either wait for Adobe to release your lens profile, or to create it yourself. The latter would obviously be much quicker than waiting for Adobe, but as you will see from the steps below, it would take a significant amount of time and effort on your side. Go to the Calibration Charts folder, select a calibration chart to fit your printer and paper, print it out and then mount it on a planar surface in a room with plenty of ambient light. Take pictures of multiple checkerboard images (a minimum of three images are required, but nine are recommended) for each camera/lens settings that you are interested in obtaining the lens profiles for. Convert your RAW images to DNG format and make sure that full EXIF data is preserved. Process the raw DNG images (or the JPEG/TIFF images if you prefer creating lens profiles for the non-raw workflow) through the Lens Profile Creator to create the custom lens profile. 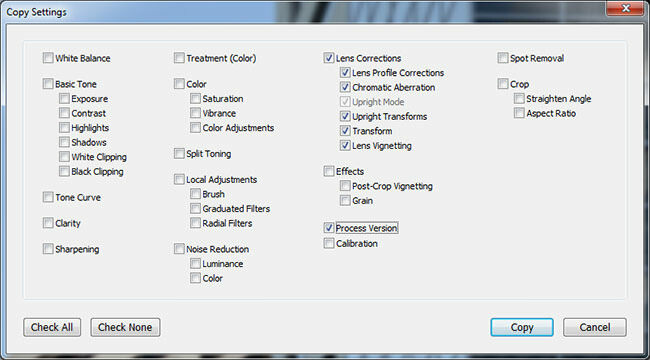 Save the lens profiles that you have created into the specific lens profiles folder(s) that Photoshop CS5, Camera Raw and Lightroom would be looking for them for lens corrections. So, in order for you to be able to create an image, you need to print out a test chart, photograph it and then feed the images to Lens Profile Creator to create a profile. Bear in mind that if you shoot with multiple camera bodies with different sensors, you will have to create profiles for each camera/lens combination. For example, if you own Nikon D810 and Nikon D7200 cameras and you have a Nikon 24mm f/1.4 lens, you will have to mount the lens on both cameras and create two separate profiles. The reason why you have to do this, is because different cameras/sensors handle lenses differently and in the case of FX vs DX, issues such as distortion and vignetting will appear less obvious on DX when compared to FX, because the corners are chopped off. If you use multiple lenses or different cameras, I would recommend to create lens profiles for all of your lenses and cameras at once. The process is time-consuming, but pretty straightforward and you should not have any problems with creating the profiles. 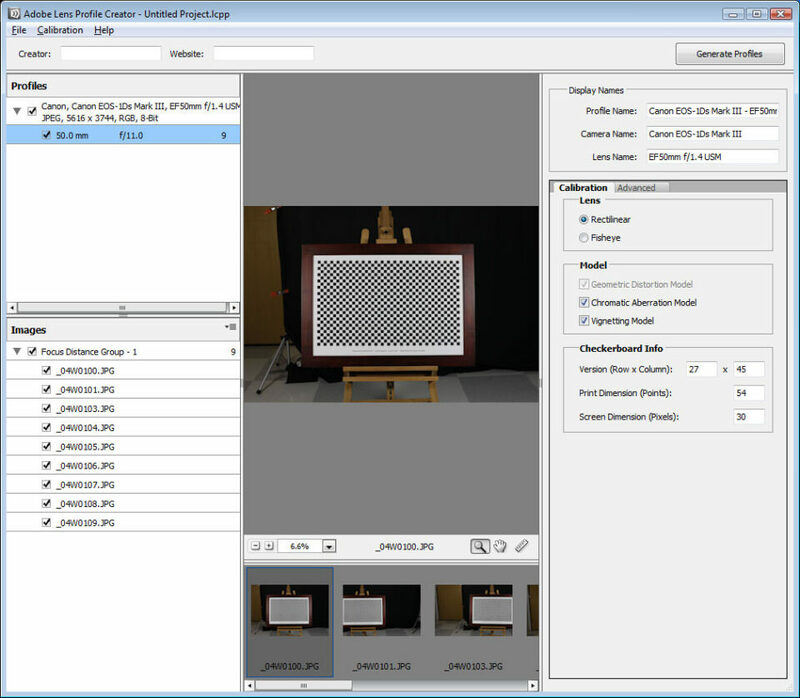 Once the profiles are generated (LCP file extension), save the files into the “C:\Users\All Users\Adobe\CameraRaw\LensProfiles\1.0” folder if you are using Windows Vista/7/8 (for other operating systems, refer to Adobe Lens Profile Creator documentation inside the documentation folder) and relaunch Lightroom. Once you do that, your images should be automatically recognized when you click “Enable Profile Corrections” within Lens Corrections in Lightroom. By the way, there are other third party software tools such as DxO Optics Pro and PTLens that contain hundreds of camera/lens combinations that you might not find in Lightroom. If you have rare lenses, you might want to give those tools a try, since they will probably have more lens profiles than Lightroom. Thanks for these articles. Unfortunately, I just have not had a lot of time recently to really go into detailed reading of them, but I do plan on doing so because they are very interesting and informative. I am especially interested nowadays in your LR articles. I have used LR almost since the first time it came out and will soon upgrade from 4.4 to version 5. I often do use the Lens Correction feature, but I’m not quite sure why because I’m not sure if I really see an “improvement” in most of my shots. True, it can straighten out some lines, but, in general, while I almost always see differences, I’m not sure I prefer a shot with or without lens correction. I think it’s more of the engineer in me….I like to do things technically correct! Anyway, I do have a question. Perhaps you’ve answered it somewhat in this article, but, again, I have to apologize because I haven’t read this article in great depth. But, my question is as follows: I have noticed that when working with a RAW file (I shoot Nikon), there are by far, a very large number of lens profiles compared to if you’re working with a JPEG. There are very few lens profiles when working with a JPEG. Do you know the reason for this? Any way to work around it? Thanks, again, for your articles…when I get a chance, I will definitely go back and read in more detail these articles, especially the ones on LR. Richard, I too feel the same about applying lens corrections selectively. Sometimes Lightroom overdoes lens corrections for me and I have to manually tweak it. Other times, I actually like the vignetting of some lenses at large apertures and fixing those images makes them appear rather dull. So it is a selective process for me – I don’t apply lens corrections upon import. But when distortion and vignetting are too strong and visible, it is nice to be able to fix those issues with a single click! As for lens profiles of RAW vs JPEG, that’s because lens profiles are really supposed to be used on RAW images, not JPEG. I just published a post on Nikon firmware updates – most corrections like distortion control and vignetting are already done on your camera when you shoot JPEG, so you would not want to apply the same thing again on those JPEG images. I saw your article about the Nikon firmware updates. I plan on doing so. Nowadays, for personal use, I mainly shoot RAW, so there is a huge selection of lenses to choose from. But my older shots are more JPEGs. I have 10 years worth of digital images…..every now and then, when I find time, I go back to the older shots and edit them. I do shoot races/marathons, for which the client requires small JPEGs. I don’t do any post-processing on these since I just upload all of the images I take on site, after the race. But, I was just curious why there are so many more lens profiles for RAW compared to JPEG. There is one potential problem with amateur photography as far as lens correction is concerned. If I am shooting with a Sigma glass on a Nikon body with JPEG output, all bets are off! Another great article, clear and concise. DxO Optics Pro works great if the lens/camera combination is supported. Their profiles include data on lens softness across the field, measurements at different focus distances and, for zooms, at different focal lengths. As much as I know their lens correction module is the most powerful among present software tools. There is, however, one drawback related to all that power: lens/sensor profile creation is a task even more complex than for Lightroom and cannot be done by the end user. So DxO is great if most of the camera/lens combinations one uses are supported but not so great if that’s not the case (the software allows manual corrections for those situations, but not as powerful as the automatic corrections). Also important to note is that is the camera/lens combination that must be supported, the camera and the lens may be supported but the profile for the combination still unavailable. DxO asks for end user feedback on desired profiles and, apparently, tries to create profiles according to user feedback (I’ve asked for a profile once and about one year later it became available. Since I’m using a camera quite old and sold in relatively low numbers I believe they really responded to my feedback). Agreed, DxO does some advanced cool stuff to fixing various lens issues. Lightroom is quite limited in comparison. However, I believe that DxO would be an overkill for most people, especially if one already uses Lightroom. Sounds good on paper… Unfortunately, when I have tried this LR feature with the 85/1.8G, it has very little or no effect on the typical green/magenta longitudinal CA that appears in highlights and out of focus areas at large apertures. Excellent article, by they way. Thanks. I’ve used the color picker only a few times, and as Nasim mentioned, from what I’ve seen, it has done a great job. I had one picture shot in the inside of a church, looking up at a dome with windows. There was all sorts of fringing up and down the vertical edges of the windows. I was able to get most if not all of that out using this color picker. One other thing….I am no expert here, and you probably already know this, but in addition to using the color picker to the left of “defringe,” I also had to play with the “Amount” sliders a little bit in order to actually remove that color fringing. For an image I just looked at, I slid one “amount” slider by 6 points to the right, and I slid the other “amount” slider by 7 points to the right. In the few pictures I have tried this on, it really has worked well. Thanks for the tutorial. It was concise and clear. I use Aperature and have a PTLens plug in for distoration correction. If you have had any experience with PTLens, any thoughts you have one the performance of it compared with LR5 lens correction would be welcome. Lens corrections is a double-edge sword. For some images it maybe absolutely necessary, others, not so much. 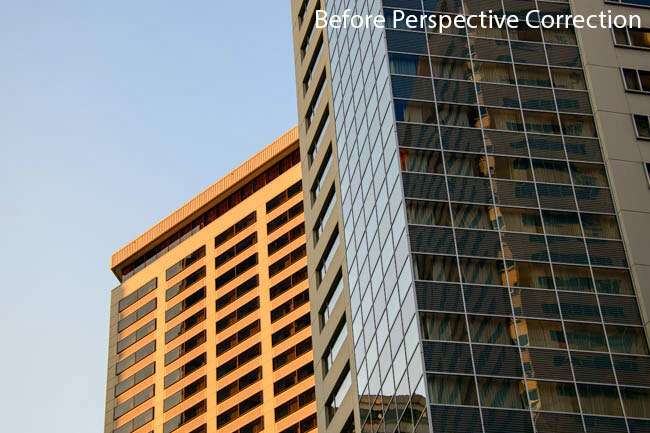 The flip side of being able to correct you lens distortion is loss of detail in the correction process. 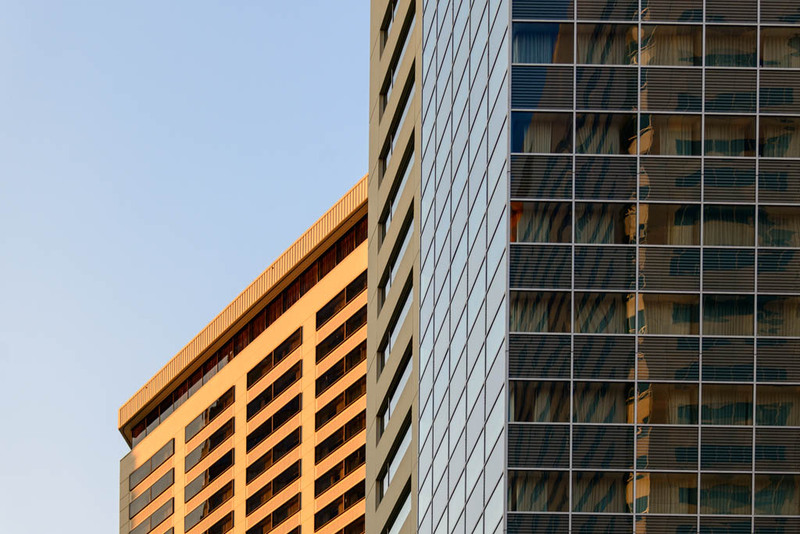 If you need or want to retain all the detail in your image, you’ll need to learn with the optical distortion in it. This brings up another subject, and that is what appears to be an apparent laziness in lens manufacturers today to make less-than-optimal lenses and then “fix it in the mix”, to borrow an old audio slogan. There was a time when wide angle lenses (the type most prone to distortion) were made to tighter tolerances than their modern counterparts. The 28 f/2.8 and 15mm f/5.6 Ai Nikkors come to mind. Even lenses like the 18mm f/3.5, 20mm f/4 and 24mm f/2.8 Ai’s were relatively well corrected, suffering mostly at the edges. Not today. When you see manufacturers incorporating correction into camera bodies today, I can’t help but feel they’re just dropping the ball in lens design. Even top tier lenses like the 14-24 and 24-70 Nikkors have dismal distortion, and these lenses don’t come cheap. granted, they’re zooms, not primes, but still, when you’re charging $2000+ for a lens, at least TRY to do it right! Great article, thanks very much for posting the information – it is sure to help me as I upgrade to Lightroom 5. One question though. I have a Canon 18-200MM lens that I use when I want to travel light. I have found the lens profile, but my questions is if the profile takes the lenses focal length into consideration during the correction. For example, a photograph taken at 18MM would need a different correction to one taken at 200MM, so I was wondering if the profile handles that conundrum or if I need to make manual adjustments to perfect the disortion? I appreciate anyone who can point me in the right direction. Does lens to chart distance matter? I am thinking that there is more apparent distortion if a short lens is held up close that farther away. I also do a lot of telephoto work and would like to create profiles especially with the horrid 2x convertor/er attached to the long lenses and this would require a long shooting range. When I shoot a project, I am creating a independent library catalog for that project. The primary .lrcat file for my non-project based work contains the lens profiles found using the Adobe Profile Downloader, however, those profiles don’t show up when I launch a new catalog. How can I copy and/or insert the lens profile(s) that I’ve used in my primary .lrcat file into each new catalog? I would like to see Lightroom 5 have lens profiles for the two most common lenses that I seem to use nowadays – Nikon 16-35mm F4 & 70-200mm F4. I think that would be useful. if I have lightroom 5.7.1 which doesn’t contain a lens correction profile for the tamron 15-30mm 2.8, but adobe now has a correction profile for the lens is there a way that I can download it? I see that it is available in lightroom 6, but I don’t want to buy it just for the lens profile. Thanks! My architectural thesis is about photogrammetry where we measure buildings inside a photograph. What if I do not know what lens and camera type was used for the photo, can I correct its distortion in Lightroom? Can Lightroom identify the amount of distortion?